Share the post "June 01st, 1953"
Another -19 degree deep freeze morning arrived, and thank goodness the wind wasn’t blowing. I just noticed on the weather report that we’re supposed to have even colder temperatures this week. Now really, that’s crazy because this cold is about a month over-due. I’m beginning to get all the more concerned over our area’s abnormal weather patterns that have taken place these past few years because there’s no telling if they’ll continue to be like this going forward due to climate change. It just happened to be my morning to play for St. Paul Lutheran Church’s 8:30 am Service. I would say it’s been personally confirmed that I’m now nearly completely comfortable with the order of their Service and even more so at playing their vintage pipe organ. The best of my unexplainable reasons, is that I’m no longer intimidated by their organ to where I can now freely play it without there being random thoughts of making noticeable mistakes when playing it “live”. I’m still in disbelief there aren’t more area Lutherans attending their Services because of my being one who’s been looking in from the outside for over a year, which has created no doubt in my mind that church’s congregation is a living example of a “family” of faith. Since I went to another church service yesterday afternoon, I noticed how even though their readings were the same, there were subtle differences in text. I actually liked today’s three readings better than yesterday’s even though they’re supposed to be the same. By the time I left St. Paul, it was rapidly warming up since the sun was shining. Just as I was driving away, I received a text message from one of my sellers saying my lockbox on the front door of her home was hanging open. Ugh! I text her back and said I’d be out there to get it closed. On my way out, I began recalling all the many times that particular agent has left doors unlocked, lights on, and other careless oversights. I’ve chided that person in the past, but I’ve come to believe I might as well save my breath to cool the soup instead of going thru another exercise in futility. I certainly don’t want to be around the day when something serious happens due to that agent’s negligence. Not much was happening in the real estate world today other than my checking on a few vacant homes to make sure their furnaces were working. As much as I believed I’d be doing more accounting work, I found myself definitely not in the mood for it, so instead I went and grabbed that stack of 1953 Globe Gazette newspapers my client gave me last week and started reading. Believe it or not, I was paging through them and reading interesting articles for over two hours! I’m glad I wasn’t in a mirrored room and seeing the expression on my face when I looked up at the clock. There’s no question our Globe Gazette’s style of writing, ad design, and subject matter has greatly changed over these past 66 years. Even the type fonts and print size is different, along with the over-all size of the paper itself. It’s no wonder all the more people are complaining about our daily tabloid. Even its section of comics was making me smile which haven’t for years. 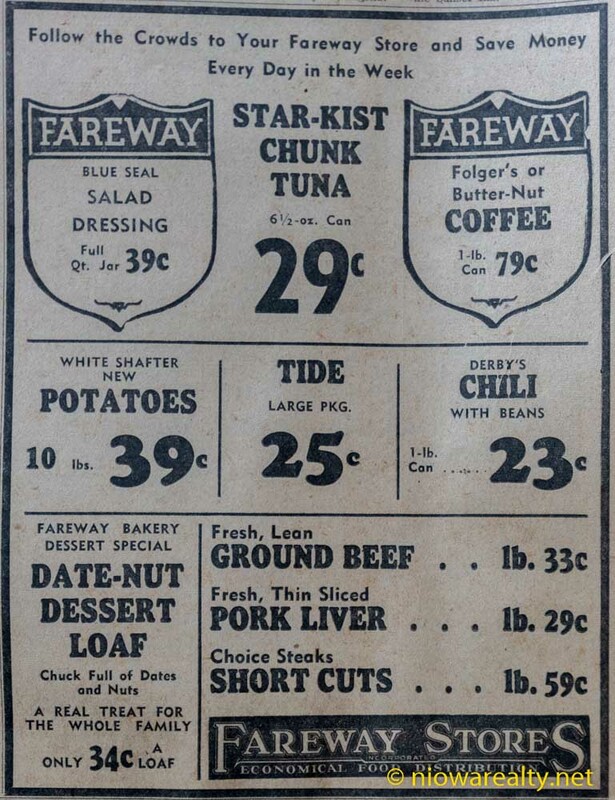 I took the above photo of Fareway’s June 01st, 1953 ad which certainly brought back some fond memories. Can you believe those prices? After reading nearly all the grocery ads in those papers, I’d say we have far too many choices being offered to where grocery shopping for young families must be all the more time consuming. Back in my day you ate what you got and that was that, and if you didn’t want to eat what you got, then too bad for you because you’d go to bed hungry, because there was never any searching for something else to fill a fussy stomach. For sure I’ll be sharing with all of you numerous photos from those papers because I know some of my readers will recognize a few of those faces and places. Let’s all call them delightful walks down memory lane. One of the faces I happened upon was of a younger man who worked at a store Downtown who as chance would have it, is the father of a gentleman who now has a quasi-management position at an office. His son now looks far older than the age of his father when that photo was taken over 66 years ago. It’s funny when thinking about it because I always remembered his father as being a retiree on a pension when I got into real estate. Speaking of grocery stores, I stopped at Aldi’s before heading home to pick up a few things. As chance would have it, I ran into a father and son whom I’ve known since I was in grade school. For sure I was glad to run into them because I’d not crossed paths with his father in years. Long after we walked away from each other, it was once again confirmed that we must continue to work at keeping in our midst all of our salt of the earth long-time residents like them who’re living here in North Iowa because there’s no question they’ve always quietly been the backbone of our community. Tonight’s one-liner is: The only thing worse than a liar, is a liar that’s also a hypocrite.